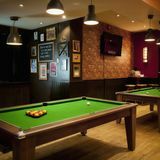 "Situated close to Aldgate, Liverpool Street and Fenchurch Street stations, Jamies Creechurch Lane offers a large dining area, perfect for business lunches and a comfortable bar with high tables and booths - the ideal place to relax with a glass of wine with friends in the evening. 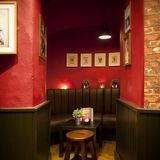 Come and check out our amazing basement bar, the ‘Creechurch Club Room’! 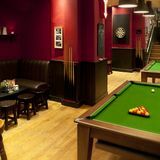 Featuring pool tables and bar billiards, it is the newest and best place in the City to wind down after a hard day’s work… particularly with a craft beer or cocktail in hand! You can find all of the usual Jamies offers in the Club Room, including our amazing 2 for 1 selected cocktails all night from 5pm (offer excludes December). " What did you think of Jamies Creechurch? I am a fan of all Jamie's but I have to admit that I have been really please with their latest acquisition. The staff is friendly...(as well as really good looking), the service is great, the food is good and come quickly. What else could you ask when you have around 1 hour for lunch and you want to impress some client. 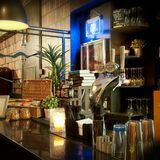 The night time is completely different, the music is great and the atmosphere is what you need after a big day at work!